Exercise has a number of physical and psychological benefits for a person of any age and this is no different for the elderly. With advancing age, the benefits of exercise are more pronounced as it helps in the prevention of many diseases seen primarily in the elderly and minimizes the effects of age-related changes in the body. However, there is often confusion as to what type of exercise best suits an older person – whether cardiovascular or weight bearing. Both are important for various reasons although there is some degree of overlapping. 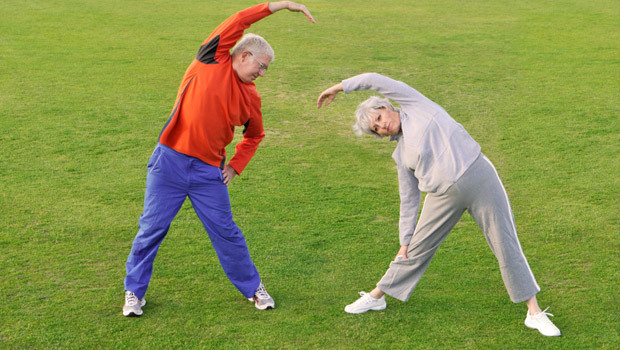 Among the cardiovascular activities, it is often walking or jogging that is considered by most senior citizens as it is easier to undertake, can be enjoyed with a partner, does not need specialized equipment and facilities and is often not as strenuous as other types of exercise. Weight control (overweight and obesity). Hyperlipidemia (high blood fats like cholesterol). Respiratory conditions such as asthma. In order to ascertain the benefits of walking, one has to differentiate between walking as means of exercising and that of leisure. Both components can be integrated but in the interests of the health benefits as well, walking should be at a brisk speed and continuous for at least 15 minutes or more. A leisurely stroll with frequent pauses in between is not as beneficial and while considered as physical activity, it is not exercising in the true sense of the word. This should not detract from the fact that like all workout routines, even leisurely walking has health benefits that outweigh a sedentary lifestyle. Walking, although not as strenuous as jogging, is nevertheless a form of exercise and the physical exertion can be taxing on the body. Any person including a senior citizen needs to be aware of individual limitations and take care not to overexert themselves. It is always advisable to speak to a medical doctor before commencing with any exercise program, and this includes walking routines. It is often in the senior years when one decides to start an activity – whether a sport, hobby or world traveling – that was not undertaken earlier in life. While the elderly are encouraged to live life to the fullest and not let physical limitations make them house bound, certain forms of exercise need to be approached cautiously. For older persons with serious underlying diseases, particularly cardiovascular conditions, it is best not to start something new if you had not been doing it for years before. A medical professional is in the best position to advise elderly patients on the different approaches to consider when starting up a new sport. Jogging does offer a greater cardiovascular workout in a shorter period of time but is also associated with greater impact on the joints and strain on the muscles when compared to walking. This needs to be taken into consideration if a senior has not been jogging earlier in life on a regular basis, lacks the cardiopulmonary (heart, blood vessels, airways, lungs) functioning for this level of activity or has musculoskeletal conditions which may be aggravated by jogging. There a few simple tips that applies to a person of any age but should be is especially significant to a senior citizen. Always consult with a doctor before starting any exercise program. Discuss it with your regular family doctor or geriatrician who has a good knowledge of your medical history. Consider walking or jogging with a partner or in groups, in well lit and safe areas with appropriate footwear. Dress appropriately. Although you may feel hot after a workout, the body can quickly lose vital body heat particularly in colder climates. Carry some form of communication if jogging through unfamiliar territory. A few coins to use in a telephone booth and some cash to pay for a taxi should the need arise is also recommended. Do not feel compelled to exert yourself or be competitive with others. Stop walking immediately and rest if there is any breathlessness, chest pain, dizziness or blurred vision. Ensure that you take your medication on time or carry it with you if your exercise routine interferes with the timing of your drug regimen. Never exercise on an empty stomach but also do not undertake strenuous activities like jogging just after a meal. Be aware of your limitations – this can refer to your mobility, eyesight, hearing and memory. Keeping physically active can slow the ageing process. Exercise is the mantra to keep young and feel good. A study published in 1995 that tracked 9,777 men between 20 and 82 years found that physically unfit men who became fit had death rates 44% lower than those who remained unfit.